Parkhurst did not produce a set of hockey cards in 1956 so here are the '55s. In Action cards #67-#77, then card #78 shows the Montreal Forum #79 shows Maple Leaf Gardens and these cards are tough. I've got 37 of these so far or about 46% of the set. Wow as I type this I realize this set has it all! Here are a couple of the all time greats which I know nothing about. I chose the Aurel Joliat card (HOF 1947) because I thought it was odd that he was wearing a cap of some kind. But wikipedia says he always wore his trademark "black cap" even though his cap appears red? 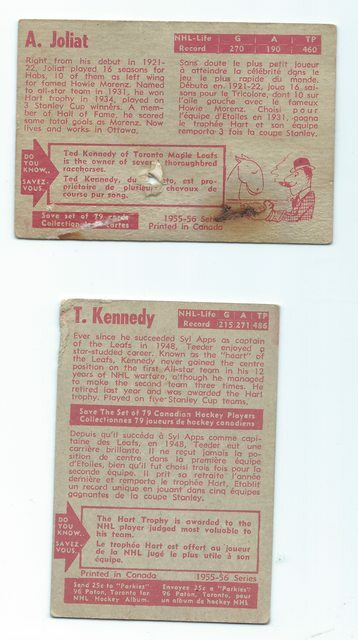 "Teeder" Ted Kennedy HOF 1966 was selected as one of hockeys 100 greatest players of all time in 2017 and played for Toronto 1943-1957. 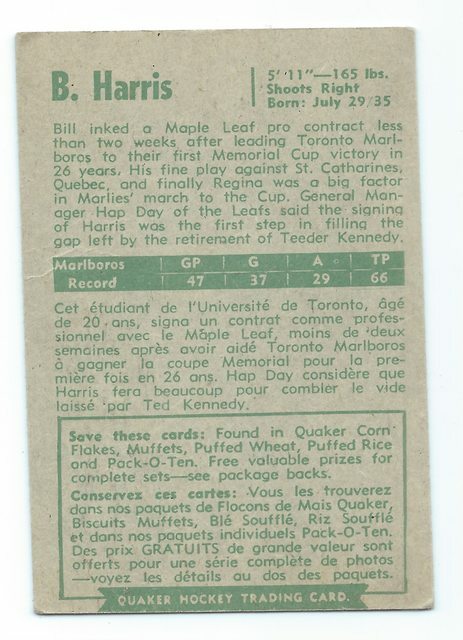 1955s are found with green backs and these were included in Quaker Oats products. Cards could be exchanged for prizes including a bicycle if you turned in a full set. This is my only example and I think these are quite tough! I've never been to an NHL game. I have attended a few minor league hockey games. I have watched NHL on TV. I mostly understand the rules. I like collecting vintage hockey cards. I don't know much about the vintage Parkhurst sets. I really don't know much about the players. Ok this thread answers my Quaker Oats question from one of your other Parkhurst threads! As for the toughness, I think there are a few Quaker Oats with only a few known examples.